Overexpressed cell-surface receptors are hallmarks of many disease states and are often used as markers for targeting diseased cells over healthy counterparts. Cell adhesion peptides, which are often derived from interacting regions of these receptor-ligand proteins, mimic surfaces of intact proteins and, thus, have been studied as targeting agents for various payloads to certain cell targets for cancers and autoimmune diseases. Because many cytotoxic agents in the free form are often harmful to healthy cells, the use of cell adhesion peptides in targeting their delivery to diseased cells has been studied to potentially reduce required effective doses and associated harmful side-effects. In this review, multiple cell adhesion peptides from extracellular matrix and ICAM proteins were used to selectively direct drug payloads, signal-inhibitor peptides, and diagnostic molecules, to diseased cells over normal counterparts. RGD constructs have been used to improve the selectivity and efficacy of diagnostic and drug-peptide conjugates against cancer cells. From this precedent, novel conjugates of antigenic and cell adhesion peptides, called Bifunctional Peptide Inhibitors (BPIs), have been designed to selectively regulate immune cells and suppress harmful inflammatory responses in autoimmune diseases. Similar peptide conjugations with imaging agents have delivered promising diagnostic methods in animal models of rheumatoid arthritis. BPIs have also been shown to generate immune tolerance and suppress autoimmune diseases in animal models of type-1 diabetes, rheumatoid arthritis, and multiple sclerosis. Collectively, these studies show the potential of cell adhesion peptides in improving the delivery of drugs and diagnostic agents to diseased cells in clinical settings. Keywords: Antigenic peptide, autoimmune disease, Bifunctional Peptide Inhibitor (BPI), cell adhesion, ICAM-1, Immunological synapse, Integrin, LFA-1, RGD. Keywords:Antigenic peptide, autoimmune disease, Bifunctional Peptide Inhibitor (BPI), cell adhesion, ICAM-1, Immunological synapse, Integrin, LFA-1, RGD. Abstract:Overexpressed cell-surface receptors are hallmarks of many disease states and are often used as markers for targeting diseased cells over healthy counterparts. Cell adhesion peptides, which are often derived from interacting regions of these receptor-ligand proteins, mimic surfaces of intact proteins and, thus, have been studied as targeting agents for various payloads to certain cell targets for cancers and autoimmune diseases. Because many cytotoxic agents in the free form are often harmful to healthy cells, the use of cell adhesion peptides in targeting their delivery to diseased cells has been studied to potentially reduce required effective doses and associated harmful side-effects. 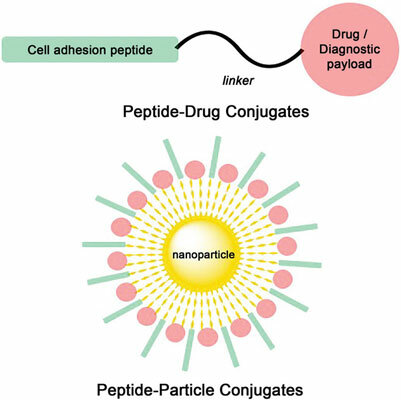 In this review, multiple cell adhesion peptides from extracellular matrix and ICAM proteins were used to selectively direct drug payloads, signal-inhibitor peptides, and diagnostic molecules, to diseased cells over normal counterparts. RGD constructs have been used to improve the selectivity and efficacy of diagnostic and drug-peptide conjugates against cancer cells. From this precedent, novel conjugates of antigenic and cell adhesion peptides, called Bifunctional Peptide Inhibitors (BPIs), have been designed to selectively regulate immune cells and suppress harmful inflammatory responses in autoimmune diseases. Similar peptide conjugations with imaging agents have delivered promising diagnostic methods in animal models of rheumatoid arthritis. BPIs have also been shown to generate immune tolerance and suppress autoimmune diseases in animal models of type-1 diabetes, rheumatoid arthritis, and multiple sclerosis. Collectively, these studies show the potential of cell adhesion peptides in improving the delivery of drugs and diagnostic agents to diseased cells in clinical settings.